Students spend more time writing than ever before! Beyond homework, much of their social interaction involves writing such as texting and posting on social media. As educators, you know that the ability to write correctly will help your students succeed, not only in school but also at work. 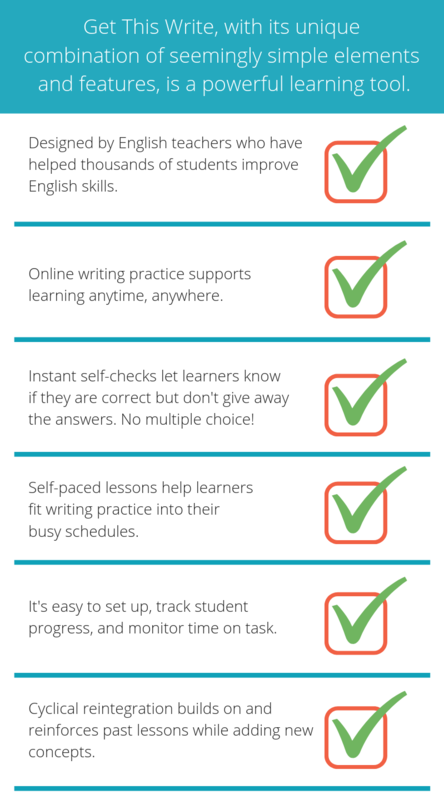 Whether your students are English learners or maybe just need a little more practice, Get This Write can help. It focuses on basic English grammar, capitalization, punctuation, and spelling. Designed by English teachers, this online tool addresses common trouble points in learning to write. Who Can Use Get This Write? We will be happy to answer questions or get you started. Please fill out the form and we will get back to you soon. How Can Teachers Use Get This Write? "Get This Write has been so helpful. I really appreciate the content of the course and has made it easy for ESL students."